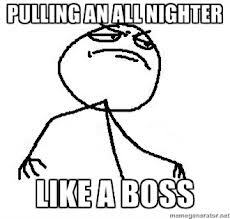 Meaning: Depriving yourself of sleep all night to do things that need to be done or you want to do. Usually used for studying. Matt: Are you going to John’s party tonight? Ben: I have a test tomorrow. Matt: Didn’t you study for the test? 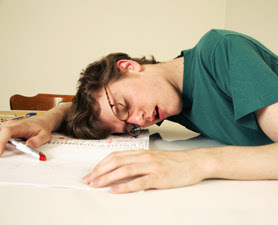 Ben: No, that’s why I have to study all night!! Matt: Man! 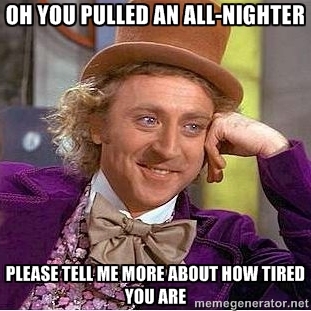 So you are going to pull an all nighter? Ben: Yeah! It looks like it! Jessica finished her final exams at her university in the morning and is now visiting her parents in the afternoon. Jessica: Hi mom!! It’s so good to see you. Mom: Thanks honey! It’s so nice to see you, too. I’ve missed you. Jessica: I’ve missed you, too. How are you? Mom: I’m great. How about you? Jessica: I’m so tired, mom!! Mom: Why were you awake all night? Were you at a club? You should focus on your studies!!! Jessica: NO Mom!!!! I was pulling an all nighter for my final exams. Mom: Oh, I see. You are such a good student, honey!